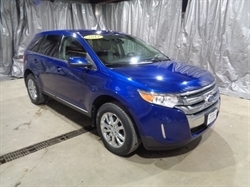 We are offering this clean Ingot Silver 2015 Ford Edge Titanium AWD with Ebony Leather heated seating! This Edge was bought here and traded back to us for a Navigator! The Edge has less than 100 miles on Brand new tires! The vehicle comes with Remote start and Dual Pane Sunroof! This Edge is an AWD so it will get you around in all types of weather with ease! These Edges are hard to come by this clean! Be sure to check the complimentary CARFAX provided online! For more information or a video walk around contact your local Motor Inn and they will be happy to assist you! Motor Inn Auto Group is family owned for over 75 years representing Buick. Chevrolet, Chrysler, Dodge, Ford, GMC, Jeep, Lincoln, Ram, and Toyota, in Algona, Carroll, Estherville, Knoxville, Spirit Lake and Okoboji with customers throughout the states of Iowa, South Dakota, Minnesota and Nebraska. Our stores provide our customers with certified automotive mechanical service, parts, tires, body shop, lease, car rental, vehicle financing, and sales with highly trained mechanics and sales representatives for both new and used vehicles with car, truck, SUV, and crossover options for all customers. Hello, I would like more information about the 2015 Ford Edge, stock# AFT5036B. Hello, I would like to see more pictures of the 2015 Ford Edge, stock# AFT5036B.